Women on a Mission: Mom Edition: T-SHIRT QUILT! I’ve just finished a quilt project of mine that I’ve been looking forward to for a long time. This hearkens back quite a few years to an evening at my GT bff Grizz’s house. 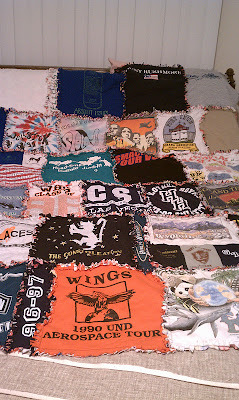 While there, I saw that her mom, CF, had a quilt made for Grizz out of all her old t-shirts. The ones from high school and college – we all have them! After that, I set aside my most favorite/sentimental t-shirts in the clothes sorting; I have long ago stopped wearing t-shirts on any regular basis. Just not my thing anymore. Too boxy and not flattering enough for my figure. But I’ve got some seriously killer memories with some of them. I just sat on this idea (and the shirt pile) for a few years, letting it mull over; and also because I was way busy with the twins. Then last November I watched Twilight saga Eclipse at the theater and Bella’s mom gave her a t-shirt quilt. That was all the catalyst I needed. 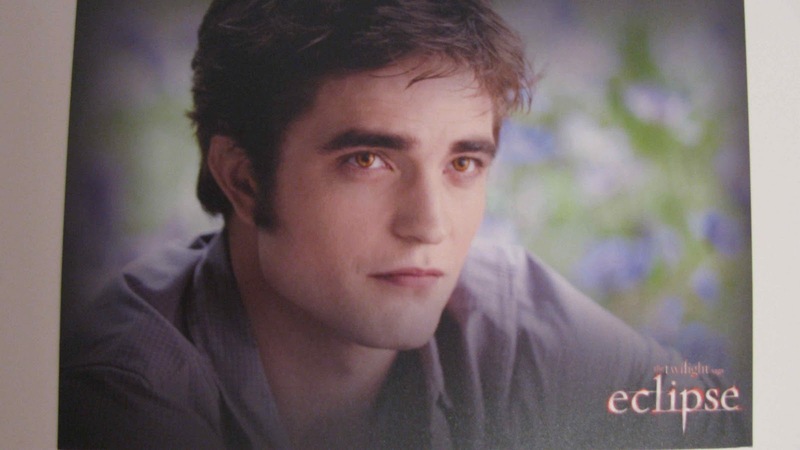 You know how I love Twilight. I had the project entirely ready to go, with that exact thought in mind. 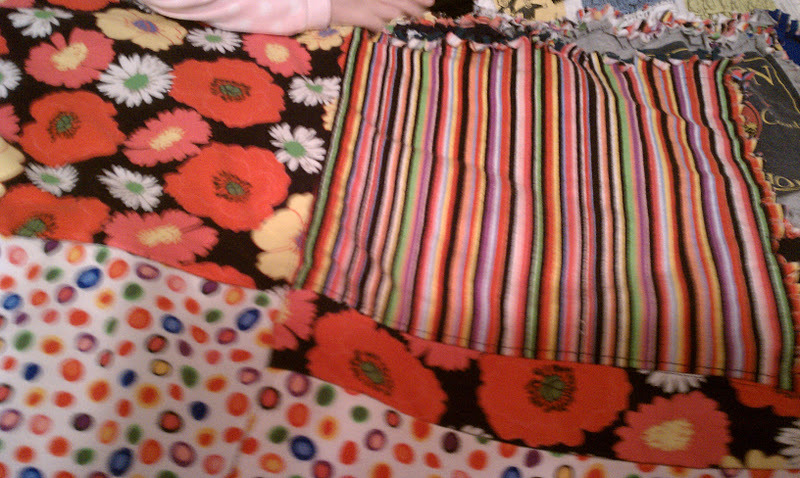 So in January I sought out my fave local fabric store, Fat Quarter quilt shop, for colorful flannel. I had seen a quilt Crafty Grandma (Lori’s mom) made that had sandwiches of flannel sewn together, with raw edges sticking out to the front. The edges were snipped and when washed it got all fluffy. This is what I planned to do. I found black and white fabrics with colorful patterns. The flannels coordinate, and that’s really all that was necessary; I needed to like the flannels since nothing about the flannel was going to coordinate with any of the t-shirts – they weren’t going to coordinate with each other either. I cut out large squares of my t-shirts and equal sized squares of flannel. 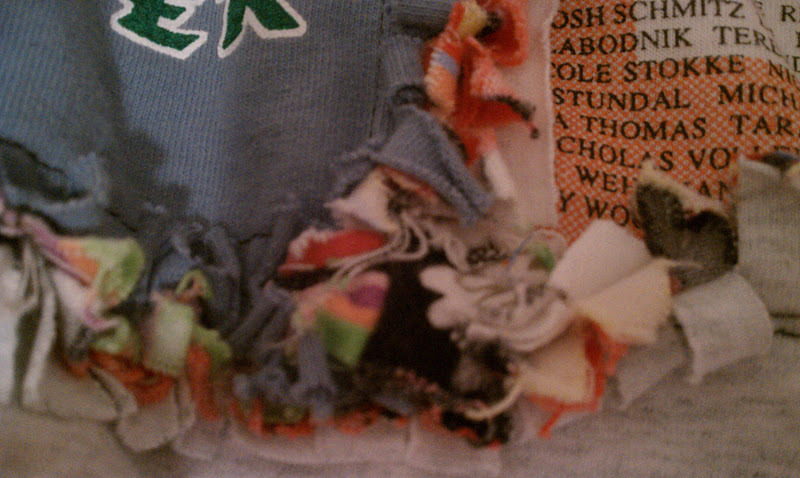 The pieces were sewn wrong sides together with about a 1” seam allowance. 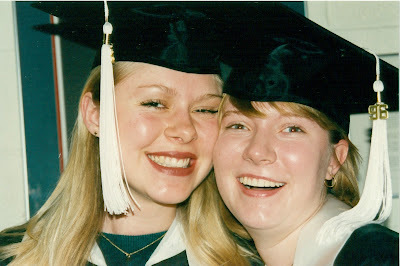 One of my all-time fave t-shirts from college - we made it! I then laid the sewn squares out in a pattern I liked (I checked the back, too, to see that the flannel fabrics aligned ok) and sewed each row of squares together. 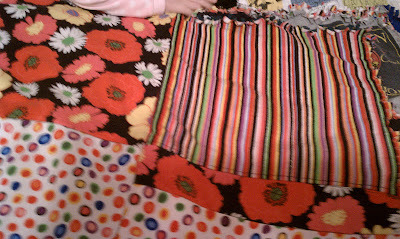 Then I sewed the rows together to make the quilt. All of the cutting took me a good day. All of the sewing took me another day. (Day can be translated into evening/partial day depending on how fast you work) The most tedious task was snipping the edges of all the squares. 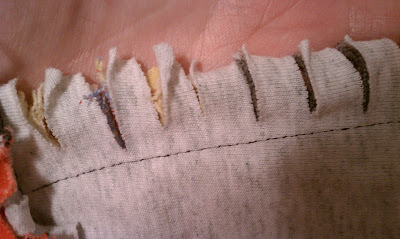 Literally every edge had to be snipped, approximately every ¼” to ½” to ensure that the fabric didn’t fray in a bunch of threads, but instead just made soft and fluffy rows. I’m serious, this took me two evenings and was a complete pain in the a$$. My hand was like a claw when it was all over and done with. Good thing I don’t have anymore fave t-shirts because I am not doing all that snipping again (I made a quilt with this technique for Shaun’s sister, HS, a few years back so I should’ve remembered the lesson). I love the end result though. Perfect for the t-shirts and an option for a homemade gift. Why did it take so long to finish? I’m not quite sure. In large part because smaller projects for the blog and the kids have taken a lot of my time. I got a bee in my bonnet on the way home from work on Tuesday, though, so I got it all done that night. There’s the WHS honor student and graduation shirts; my 1990 Earth Day shirt; the 1988 Fort Union Grand Dedication shirt (the National Park my dad was superintendent of back in my school days); my UM YA YA college motto shirt; my Mt. Rushmore staff shirt (I was a Park Ranger at Mt. Rushmore in college); and my Pod 124 Absolut ad t-shirt we made and had screen printed ourselves. The beauty of it all is I get to look at this and these memories every day I snuggle up with this quilt. LOVE IT. 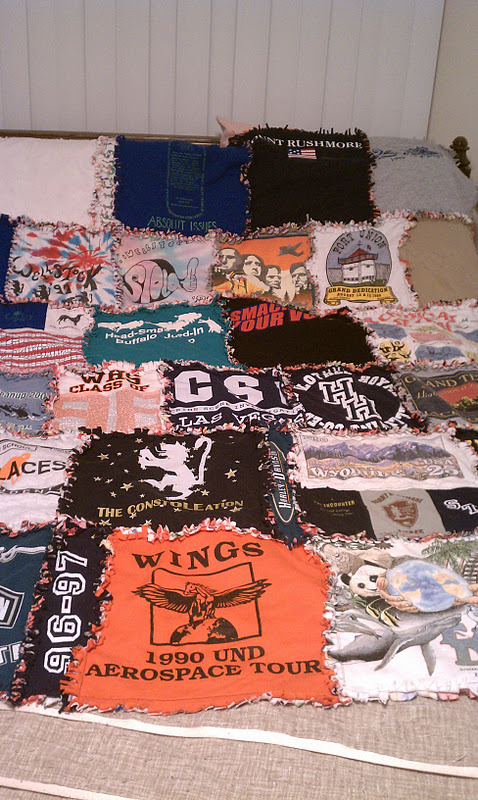 Oh, and in case you’re wondering, go with a 14” x 14” t-shirt square for your quilt if you make one. I started out with 12” squares and realized quickly that wouldn’t be big enough. Caused me a bit of grief to even all that up. I don’t remember the flannel maker and name; I bought it almost a year ago, sorry.